Many brides feel clueless on what to expect for their first bridal appointment, which can definitely add to the stress of wedding planning! So we’re giving you the rundown on what to expect. Don’t be scared, by the end of this you’ll be an expert + ready for your appointment! 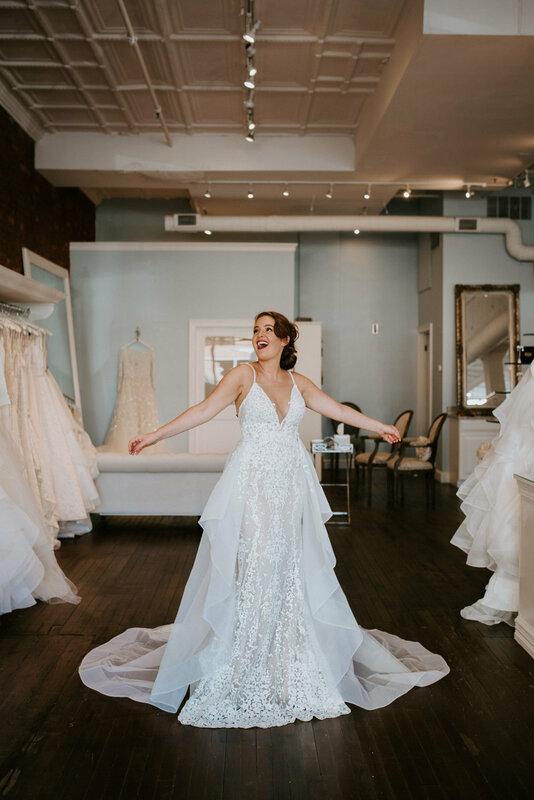 If we had a dollar for every time a bride came in looking for one style and fell in love with the total opposite, let’s just say we’d be giving out wedding gowns for free! Go outside your comfort zone & try all silhouettes. The worst that can happen is you say no! We promise it will make you feel better knowing you gave it a try and didn’t like it instead of always wondering. 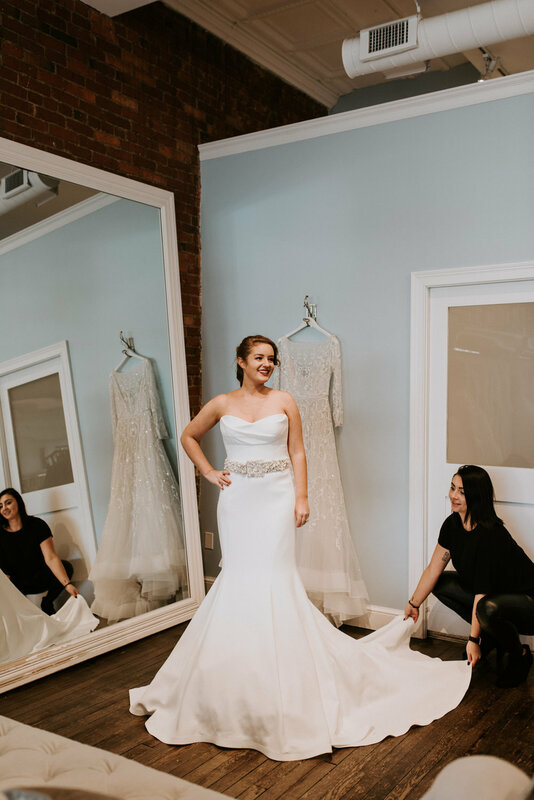 As your personal bridal stylist, it’s our job to clip and adjust the samples to make them look as realistic as possible, which sometimes means we will be in your personal bubble! Also be prepared to strip down to your bra & underwear, sometimes less! We’ve seen just about everything in the fitting rooms, so nothing you do (or don’t) is going to offend us! (But please do wear underwear….yes this has happened) The most important thing is that you feel comfortable! It’s great to have your #bridetribe and family’s opinion of course, but remember: you’re the one who has to wear the gown. You don’t want to look back and regret the decision you made! Just make sure you make the decision for YOU and no one else! 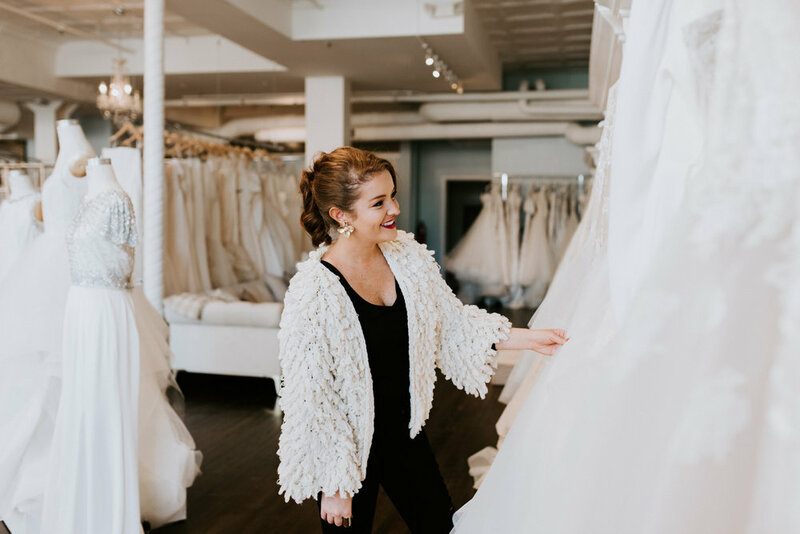 FOMO is real, and some brides feel they need to go to 10 different bridal stores just to make sure they didn’t miss anything. But going multiple places can be extremely overwhelming! Here’s the thing: if you feel great in the gown, it has everything you asked for and you don’t want to take it off, chances are you’ve found THE one! If you don’t like a dress, tell your stylist and try to communicate what it is that you don’t like about it. It won’t hurt our feelings, we promise! It makes it much easier if we can work it out together instead of pulling the same gowns over and over with the same details you don’t like. And don’t worry if you don’t understand our bridal terminology, just ask and we can break it down for you! Stay tuned for part II in our next post!